Many service companies struggle with determining the best point-to-point routes for their staff. Each day holds a new list of customer appointments. In addition, there are last minute changes to fit in. Your fleet needs an integrated approach that includes data from vehicle and asset telematics that can assist with optimizing routes. Fleet schedules are rarely the same, changing daily to meet customer demands. Even a more stable route, such as water bottle delivery, has to adapt to people moving in and out of a rep’s territory. Then there are the businesses with new appointments or destinations every day such as plumbers or delivery services. How can these and other types of service companies utilize an integrated system to route and monitor their teams? This data allows you to manage appointments better and adapt to current situations and conditions. For example, maps may not only display your assets but also show updated roads, posted speed limits and traffic incidents such as construction zones and road closures. Combined with in-cab navigation such as two-way messaging and job status, dispatchers help drivers navigate their routes more easily so your team can remain on time to their next location. One Molly Maid franchise had unsatisfied customers due to regularly missing appointments. They implemented FleetOutlook to improve scheduling, routing, navigation and field updates. Now, managers use key metrics to plan the day efficiently. Read the full case study here. The City of Ann Arbor needed help managing their city’s public works vehicles and manual work order processes. They chose GovOutlook™ to improve customer service. Now, the Michigan city has real-time visibility into their fleets’ location with ArcGIS and operating status. There was an added bonus for residents. Read the full case study here. Data on vehicles and assets from a telematics solution offers actionable key performance metrics. Whether used alone or integrated into other systems, the information helps improve customer service, increase worker productivity and streamline operating costs such as maintenance. Moreover, manual processes can be reduced or eliminated which saves time and money. 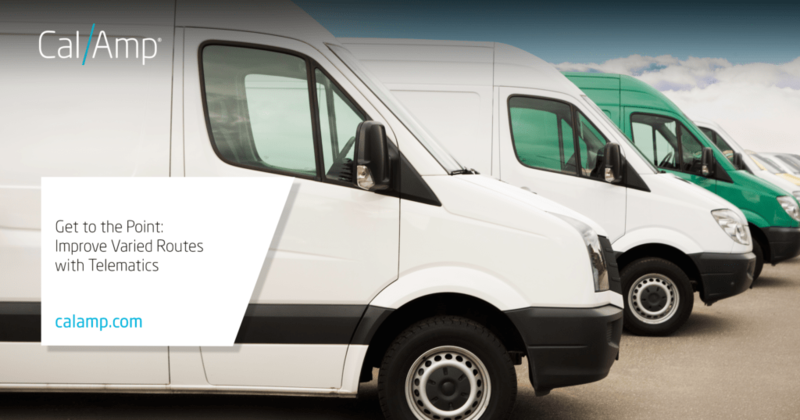 To learn more about CalAmp’s Commercial Fleet solutions, visit our page here.